New students at the inaugural NAV1GATE New Student Convocation last year. UNC Greensboro will host its second annual NAV1GATE New Student Convocation on Monday, Aug. 13, from 8 a.m. to 4 p.m. on campus. The event, designed for incoming freshmen and transfer students, serves as the official first day of the academic year. Students will hear from Chancellor Franklin D. Gilliam, Jr., connect with faculty, staff and student leaders, learn more about resources and support systems across campus and participate in university traditions. The event ends with a Convocation Craze and Blue and Gold Dessert Bar at the Kaplan Center. Throughout the day, several campus streets may be impacted by closures. To read more about road closures, click here. Faculty and staff are encouraged to wear blue and gold on Monday and are invited to view a livestream of the Convocation Celebration on the UNCG Admissions Facebook page starting at 8:30 a.m. More details about how to engage on social media are below. 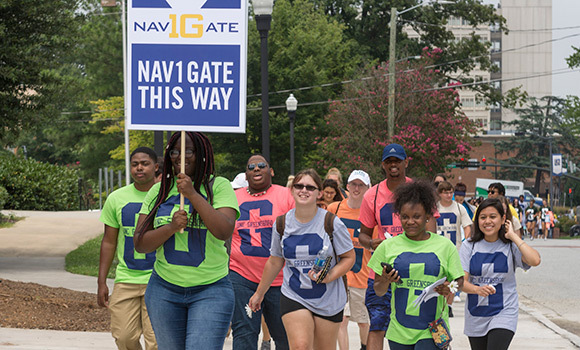 To learn more about NAV1GATE, visit newstudents.uncg.edu/yfy/nav1gate. View highlights and updates from the day on our social media channels, including the University Twitter and Instagram pages. Undergraduate Admissions will stream the Convocation Celebration on its Facebook page Monday morning. View it here starting at 8:30 a.m. Participating students are encouraged to tag their photos #NAV1GATEUNCG. Those who do so on Instagram that day and follow the @uncg account are eligible to win a $50 SpartanCash card. Event Snapchat filters will be available at the Convocation Celebration at Coleman Gym and the Convocation Craze at the Kaplan Center.